Riorden de Deveraux slammed to the floor with the wind knocked out of him. He growled in outrage, threw his cape out of his way and put forth his sword ready to encounter the fool who dared to take him unawares. A startled gasp rang out and a young woman, oddly attired in a type of gown he was unfamiliar with, all but ran from behind a counter in his direction. She appeared frantic and Riorden once more looked about him for the danger that surely plagued him and the woman who rushed to his side. Seeing nothing imminent that he should fear, lest ’twas a bookshelf that would topple over upon him, he sheathed his sword and took in his surroundings. By God’s Wounds! Where was he and how did he get in a place filled with books of all places? Last he remembered he was in the middle of a siege at Berwyck Castle near the Scottish boarder. “My Lord de Deveraux.” The woman spoke his name as if they had met afore but he had no recollection of her, nor of this place. “I am but a knight, my lady, and have not assumed my father’s title,” Riorden declared, not wishing to think of his father and Marguerite together. Riorden’s brow rose. The woman’s mind was surely addled. “Have we met?” he asked warily. “My lady,” he murmured with a hasty bow, still unsure of this woman who seemed desperate to usher him to a remote area of the bookshop. He had no time to dally with a woman this day. He must needs return to Berwyck to guard the Devil’s Dragon of Blackmore, not that Dristan could not do so himself. “You shall see.” With the slightest push, Riorden found the door closing, almost slamming shut on his sorry arse. “We have not met afore, madam. I am sure I would remember you had we done so,” he declared through pursed lips. 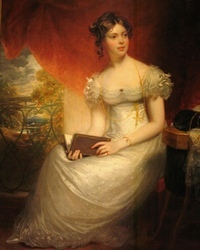 A giggle escaped her; the woman must be as daft as the Lady Constance. “I think not,” he answered, folding his arms across his chest. “So stubborn. Why I created such a trait in you is beyond me,” she mumbled more to herself than for him to overhear he supposed. “Who are you?” Riorden demanded. “Why have you summoned me here, witch? You must needs return me to Berwyck posthaste. She began playing with the feather on the quill. “What part of your question should I answer first?” She smiled and sat there as patiently as could be as though she had all of Time to await his answer. Riorden fumed. “Who are you?” he asked again. “H-how did you come by such information,” he sputtered. He had not told anyone of the dreams he had been having of late. They had disturbed him for the woman was much like a ghost haunting his every waking hour. “You are a witch,” Riorden said crossing himself and unsure what this woman would spout about next. “You are jesting with me and I do not like it. Return me from whence I came. She stood and came over to him. Afore he knew what she was about, she pulled upon his armor, rose on the tips of her feet and kissed both his cheeks. She then held his face between her hands staring up into his eyes. 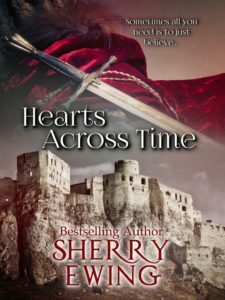 Riorden de Deveraux can be found in Sherry Ewing’s special edition box set, Hearts Across Time (The Knights of Berwyck, A Quest Through Time Novel (Books 1 & 2) available for just $0.99. 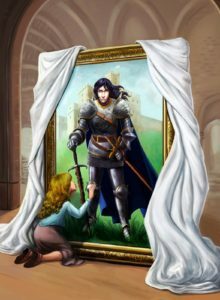 He is also a secondary character in Sherry’s debut novel If My Heart Could See You that is the beginning of her Knights of Berwyck, A Quest Through Time series. Lady Constance Whittles is a secondary character in Under the Mistletoe that is also available as of May 8, 2016.